Oldowan is pre-dated by Lomekwian tools at a single site dated to 3.3 mya (million years ago). It is not clear if the Lomekwian industry bears any relation to the Oldowan. The term Oldowan is taken from the site of Olduvai Gorge in Tanzania, where the first Oldowan lithics were discovered by the archaeologist Louis Leakey in the 1930s. 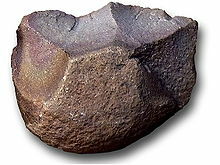 However, some contemporary archaeologists and palaeoanthropologists prefer to use the term Mode 1 tools to designate pebble tool industries (including Oldowan), with Mode 2 designating bifacially worked tools (including Acheulean handaxes), Mode 3 designating prepared-core tools, and so forth. Classification of Oldowan tools is still somewhat contentious. Mary Leakey was the first to create a system to classify Oldowan assemblages, and built her system based on prescribed use. The system included choppers, scrapers, and pounders. However, more recent classifications of Oldowan assemblages have been made that focus primarily on manufacture due to the problematic nature of assuming use from stone artefacts. An example is Isaac et al. 's tri-modal categories of "Flaked Pieces" (cores/choppers), "Detached Pieces" (flakes and fragments), "Pounded Pieces" (cobbles utilized as hammerstones, etc.) and "Unmodified Pieces" (manuports, stones transported to sites). 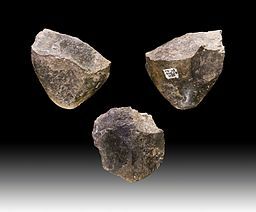 Oldowan tools are sometimes called "pebble tools", so named because the blanks chosen for their production already resemble, in pebble form, the final product. It is not known for sure which hominin species created and used Oldowan tools. Its emergence is often associated with the species Australopithecus garhi and its flourishing with early species of Homo such as H. habilis and H. ergaster. Early Homo erectus appears to inherit Oldowan technology and refines it into the Acheulean industry beginning 1.7 million years ago. By 1.8 mya early Homo was present in Europe, as shown by the discovery of fossil remains and Oldowan tools in Dmanisi, Georgia. Remains of their activities have also been excavated in Spain at sites in the Guadix-Baza basin and near Atapuerca. Most early European sites yield "Mode 1" or Oldowan assemblages. The earliest Acheulean sites in Europe only appear around 0.5 mya. In addition, the Acheulean tradition does not seem to spread to Eastern Asia. It is unclear from the archaeological record when the production of Oldowan technologies ended. Other tool-making traditions seem to have supplanted Oldowan technologies by 0.25 mya. Heavy-duty tools could be used as axes for woodworking. Both choppers and large flakes were probably used for this purpose. Once a branch was separated, it could be scraped clean with a scraper, or hollowed with pointed tools. Such uses are attested by characteristic microscopic alterations of edges used to scrape wood. Oldowan tools could also have been used for preparing hides. Hides must be cut by slicing, piercing and scraping them clean of residues. Flakes are most suitable for this purpose. In the mid-1970s, Glynn Isaac touched off a debate by proposing that human ancestors of this period had a "place of origin" and that they foraged outward from this home base, returning with high-quality food to share and to be processed. Over the course of the last 30 years, a variety of competing theories about how foraging occurred have been proposed, each one implying certain kinds of social strategy. The available evidence from the distribution of tools and remains is not enough to decide which theories are the most probable. However, three main groups of theories predominate. Along the Nile River, within the 100-foot terrace, evidence of Chellean or Oldowan cultures has been found. 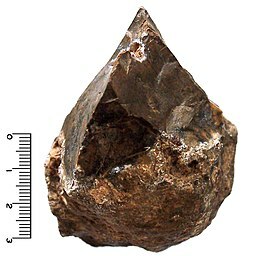 Oldowan tools have been found at: Lézignan-la-Cèbe, 1.5 mya; Abbeville, 1–.5 mya; Vallonnet cave, French Riviera; Soleihac, open-air site in Massif Central. Oldowan tools have also been found at Tautavel in the foothills of the Pyrenees. 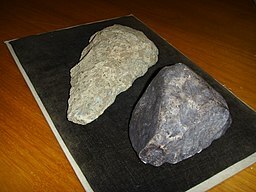 These were discovered by Henry de Lumbley alongside human remains (cranium). The tools are of limestone and quartz. ^ Harmand, Sonia; Lewis, Jason E.; Feibel, Craig S.; Lepre, Christopher J.; Prat, Sandrine; Lenoble, Arnaud; Boës, Xavier; Quinn, Rhonda L.; Brenet, Michel; Arroyo, Adrian; Taylor, Nicholas; Clément, Sophie; Daver, Guillaume; Brugal, Jean-Philip; Leakey, Louise; Mortlock, Richard A.; Wright, James D.; Lokorodi, Sammy; Kirwa, Christopher; Kent, Dennis V.; Roche, Hélène (May 2015). "3.3-million-year-old stone tools from Lomekwi 3, West Turkana, Kenya". Nature. 521 (7552): 310–315. doi:10.1038/nature14464. PMID 25993961. ^ Christopher Joyce (April 15, 2015). "New Discovery Of World's Oldest Stone Tools". NPR. Retrieved April 18, 2015. ^ Clark, J. G. D. (1969). World prehistory: a new outline. Cambridge: Cambridge University Press. ^ Clark, J.; de Heinzelin, J.; Schick, K.; Hart, W.; White, T.; WoldeGabriel, G.; Walter, R.; Suwa, G.; Asfaw, B.; Vrba, E.; et al. (1994). "African Homo erectus: Old radiometric ages and young Oldowan assemblages in the middle Awash Valley, Ethiopia". Science. 264 (5167): 1907–1909. doi:10.1126/science.8009220. PMID 8009220. ^ Leakey, Mary (1971). A Summary and Discussion of the Archaeological Evidence from Bed I and Bed II, Olduvai Gorge, Tanzania. Human Origins. pp. 431–460. ^ Isaac, G. Ll., Harris, J. W. K. & Marshall, F. 1981. "Small is informative: the application of the study of mini-sites and least effort criteria in the interpretation of the Early Pleistocene archaeological record at Koobi Fora, Kenya." in "Inter-nacional de Ciencias Prehistoricas Y Protohistoricas", Mexico City. Mexico, pp. 101–119. ^ Napier, J. (November 1962). "Fossil Hand Bones from Olduvai Gorge". Nature. 196 (4853): 409–411. doi:10.1038/196409a0. ^ a b De Heinzelin, J; Clark, JD; White, T; Hart, W; Renne, P; Woldegabriel, G; Beyene, Y; Vrba, E (1999). "Environment and behavior of 2.5-million-year-old Bouri hominids". Science. 284 (5414): 625–9. doi:10.1126/science.284.5414.625. PMID 10213682. ^ Richards, M.P. (December 2002). "A brief review of the archaeological evidence for Palaeolithic and Neolithic subsistence". European Journal of Clinical Nutrition. 56 (12): 1270–1278. doi:10.1038/sj.ejcn.1601646. PMID 12494313 . ^ Whiten, A.; Goodall, J.; McGrew, W. C.; Nishida, T.; Reynolds, V.; Sugiyama, Y.; Tutin, C. E. G.; Wrangham, R. W.; Boesch, C.; et al. (1999). "Cultures in Chimpanzees". Nature. 399 (6737): 682–685. doi:10.1038/21415. PMID 10385119. ^ Schaik, CP; Ancrenaz, M.; Borgen, G.; Galdikas, B.; Knott, C. D.; Singleton, I.; Suzuki, A.; Utami, S. S.; Merril, M.; et al. (2003). "Orangutan cultures and the evolution of material culture". Science. 299 (5603): 102–105. doi:10.1126/science.1078004. PMID 12511649. ^ Ko, Kwang Hyun. "Origins of human intelligence: The chain of tool-making and brain evolution" (PDF). Anthropological Notebooks. 22 (1): 5–22. ^ Panger, M. A.; Brooks, A. S.; Richmond, B. G.; Wood, B. (2002). "Older than the Oldowan? Rethinking the emergence of hominin tool use". Evolutionary Anthropology: Issues, News, and Reviews. 11 (6): 235–245. doi:10.1002/evan.10094. ^ Swisher, C. C.; Curtis, G. H.; Jacob, T.; Getty, A. G.; Suprijo, A.; Widiasmoro (1994). "Age of the earliest known hominids in Java, Indonesia". Science. 263 (5150): 1118–1121. doi:10.1126/science.8108729. PMID 8108729. ^ Zhu, R. X.; Potts, R. R.; Xie, F.; Hoffman, K. A.; Shi, C. D.; Pan, Y. X.; Wang, H. Q.; Shi, R. P.; Wang, Y. C.; et al. (2004). "New evidence on the earliest human presence at high northern latitudes in northeast Asia". Nature. 431 (7008): 559–562. doi:10.1038/nature02829. PMID 15457258. ^ "Skull Fossil Challenges Out-of-Africa Theory". news.nationalgeographic.com. ^ Oms, O.; Pares, J. M.; Martinez-Navarro, B.; Agusti, J.; Toro, I.; Martinez-Fernandez, G.; Turq, A. (2000). "Early human occupation of Western Europe: Paleomagnetic dates for two paleolithic sites in Spain". Proceedings of the National Academy of Sciences. 97 (19): 10666–10670. doi:10.1073/pnas.180319797. PMC 27082. PMID 10973485. ^ Pares, J. M.; Perez-Gonzalez, A.; Rosas, A.; Benito, A.; Carbonell, E.; Huguet, R.; Huguet, R (2006). 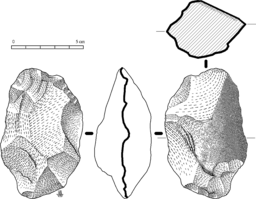 "Matuyama-age lithic tools from the Sima del Elefante site, Atapuerca (northern Spain)". Journal of Human Evolution. 50 (2): 163–169. doi:10.1016/j.jhevol.2005.08.011. PMID 16249015. ^ Ambrose, S. H. (2001). "Paleolithic technology and human evolution". Science. 291 (5509): 1748–1753. doi:10.1126/science.1059487. PMID 11249821. ^ There is a good online summary of Mary's classification on Effland's site for Anthropology ASB22 at Mesa Community College in Arizona, apparently written by Effland. ^ Susman, R. L. (July 1991). "Who Made the Oldowan Tools? Fossil Evidence for Tool Behavior in Plio-Pleistocene Hominids". Journal of Anthropological Research. 47 (2): 129–151. doi:10.1086/jar.47.2.3630322. ^ Carvalho, S.; Cunha, E.; Sousa, C.; Matsuzawa, T. (July 2008). "Chaînes opératoires and resource-exploitation strategies in chimpanzee (Pan troglodytes) nut cracking". Journal of Human Evolution. 55 (1): 148–163. doi:10.1016/j.jhevol.2008.02.005. ^ Klein, Richard G. (22 April 2009). The Human Career: Human Biological and Cultural Origins (Third ed.). Chicago: University of Chicago Press. pp. 258–259. ISBN 978-0-226-02752-4. Retrieved 20 May 2014. ^ Semaw, Sileshi (2000). "The World's Oldest Stone Artefacts from Gona, Ethiopia: Their Implications for Understanding Stone Technology and Patterns of Human Evolution Between 2·6–1·5 Million Years Ago". Journal of Archaeological Science. 27 (12): 1197–1214. doi:10.1006/jasc.1999.0592. ^ de la Torre, Ignacio; deBeaune, S.; Davidson, I.; Gowlett, J.; Hovers, E.; Kimura, Y.; Mercader, J.; de la Torre, I. (2004). "Omo Revisited: Evaluating the Technological Skills of Pliocene Hominids". Current Anthropology. 45 (4): 439–465. doi:10.1086/422079. ^ a b c d Bishop, L. C.; Plummer, T. W.; Ferraro, J. V.; Braun, D.; Ditchfield, P. W.; Hertel, F.; Kingston, J. D.; Hicks, J.; Potts, R. (Mar–Jun 2006). "Recent Research into Oldowan Hominin Activities at Kanjera South, Western Kenya". The African Archaeological Review. 23 (1/2): 31–40. doi:10.1007/s10437-006-9006-1. JSTOR 25470615. ^ Thomas Plummer (2005). Stahl, Ann Brower (ed.). African Archaeology. Malden, MA: Blackwee Publishing Ltd. pp. 55–92. ^ Barham & Mitchell, Lawernce & Peter (2008). The First Africans. Cambridge World Archaeology. pp. 126–127. ^ Kimura, Yuki (2002). "Examining time trends in the Oldowan technology at Beds I and II, Olduvai Gorge". Journal of Human Evolution. 43 (3): 291–321. doi:10.1006/jhev.2002.0576. ^ Breuil, Abbé Henri (December 1945). "A Preliminary Survey of Work in South Africa". The South African Archaeological Bulletin. 1 (1): 5–7. doi:10.2307/3886662. JSTOR 3886662. ^ Many scientists had drawn the erroneous conclusion that Homo habilis was the predator responsible for these remains, using Oldowan tools. The higher percentage of primate bones was interpreted as a kind of cannibalism, feeding the imagination of Raymond Dart. Brain examined the bones and concluded that the marks resulting from stripping and chewing the bones were made by a leopard. ^ Vekua, A.; Lordkipanidze, D.; Rightmire, G. P.; Agusti, J.; Ferring, R.; Maisuradze, G.; et al. (2002). "A new skull of early Homo from Dmanisi, Georgia". Science. 297 (5578): 85–9. doi:10.1126/science.1072953. PMID 12098694. ^ Taymazov A.I. (2011) Main characteristics of the industry at Ainikab I multilayer Early Paleolithic site (based on the data from the 2005–2009 investigations). Russian Archaeology, #1, 1-9. ^ Chepalyga A.L., Amirkhanov Kh.A., Trubikhin V.M., Sadchikova T.A., Pirogov A.N., Taimazov A.I. Geoarchaeology of the earliest paleolithic sites (Oldowan) in the North Caucasus and the East (2012). International Conference GEOMORPHIC PROCESSES AND GEOARCHAEOLOGY: From Landscape Archaeology to Archaeotourism. Moscow-Smolensk, 20–24 August.